News - Local Promoter and Local Fighter Team up Again! Local Promoter and Local Fighter Team up Again! With his next event getting closer and closer, Andre Kut's phone never stops ringing. As president of KEA Boxing, he's the promoter of next Saturday's "Fight Night at the Park II" inside the grand ballroom of a catering hall in Bergen County, and there are hundreds of details still to be covered before the professional boxers enter the ring. "It's hectic," Kut said, "but it's a good hectic. With a lot of the work already behind you, it's exciting to get closer and closer to fight night." And, Kut has been a part of plenty of them over the past 30 years, first as a boxer, himself, then as a trainer, manager and match-maker before concentrating on promotions beginning in 2004. Still, after all those rounds in all those ballrooms and arenas, it's obvious that he still gets pumped up over whatever fight night is coming up next, including this one. For one thing, KEA's top prospect, Juan "The Beast" Rodriguez is the main event in Saturday's show at Scheutzen Park, in North Bergen, the same catering hall that hosted Kut's most recent show on April 13. With a record of 11-0, Rodriguez is just now starting to get some big-time attention, and a few more victories could put him in line for bouts on HBO or Showtime. First, of course, he's got to keep winning. A loss on Saturday could set him back by months, at the very least. And then there's Anthony Gangemi, the former Pope John High School football co-captain. Each pro fight is big for him, after he enjoyed great success as an amateur. "I've got to keep winning," Gangemi said. "This is another step in my career. In this sport, you can't take anything for granted. You've got to show up ready to compete and I'll be ready Saturday night." During high school, Gangemi was the state amateur champ at 165 pounds, then the New Jersey Golden Gloves champ at 152 pounds. He'll enter the ring with a 3-0 record as a light middleweight, sometimes known as a super welterweight, at 154 pounds. When he's not in the gym preparing for his next bout, Gangemi, a 2009 Pope John grad, commutes to Manhattan where he's enrolled at John Jay College of Criminal Justice. He'll be squaring off against left-hander Steve McKinney from Chicago in his upcoming fight, but he's far from intimidated since he toured the nation and fought plenty of lefties during his amateur days. "You change things a little bit, but not a lot," he said. "It's mostly some adjustments in terms of angles. That's not going to bother me. I won't let that bother me." As for Kut, the one thing he can't control in any of the eight bouts on the card on Saturday is who wins and who loses. That can only be decided by the boxers in the ring. But, Kut does choreograph the rest of the night -- choosing the site, signing the contracts, paying the boxers, selling tickets, hiring the referees and complying with all the paperwork and regulations issues by the New Jersey Athletic Control Board, not to mention hiring the dj for background music and the traditional ring-card models to keep the audience alert and informed in between rounds. "This is the minor leagues of boxing," he said. "This isn't Atlantic City or Madison Garden but this is where those guys come from. You pay your dues, you fight on cards like this and if you keep fighting and keep winning, then the bigger nights await you in the future." Kut hopes that's the case with Rodriguez, whose been his client since he first turned pro a few years ago. "Juan is getting there," Kut said. "You don't just say you're a pro and then fight for a title. First, you go to school. That's what those early fights are. Juan has graduated from elementary school and how he's halfway through high school. A few more fights, a few more wins..."
That's where Kut's voice trails off and he just smiles. -- "I intend to be the world welterweight champion," said Rodriguez, who will be facing a 4-0 prospect named Zack Ramsey. "This fight on July 27 is special for me because it's my next opportunity to take a step forward, and you don't get that many opportunities, you have to jump on each one." -- Rodriguez will sleep most of the day away on Saturday, just getting up to eat three square meals, including pasta for dinner. Gangemi will get up early and eat a large breakfast, including an omlette and grilled chicken, at his favorite diner. Then, he won't eat again until after the fight. 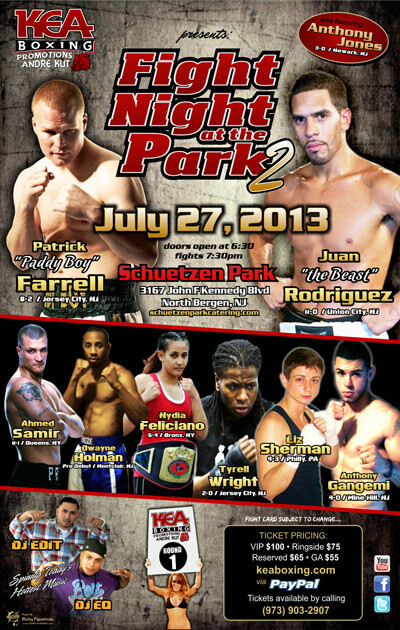 -- Saturday night's card includes a women's fight showcasing Bronx standout Nydia Feliciano. The co-feature, along with Rodriquez, is Jersey City heavyweight Patrick "Paddy Boy" Farrell (8-2). Another heavyweight, Tyrell Wright, of Jersey City, tries to extend his young 2-0 record, while Newark middleweight Anthony Jones puts his 3-0 mark on the line.